Why is Uber, Lyft and other ridesharing services having problems with the PTC? Because the taxi cab cartel continues to be alive and well in Hillsborough County. Because the Public Transportation Commission (PTC) is a poster child of regulatory capture as we posted previously. The article below about a fund raising event for Yolie Capin was published in the La Gaceta newspaper. Capin is currently a Tampa City Council representative for District 3 at Large district running for re-election in March 2015. It's never too soon to start the campaign donations flowing. The municipal races are non-partisan. Capin is a Democrat and a number of prominent Democrats are shown on her fundraising host committee: County Commissioners Kevin Beckner and Les Miller (previously on the PTC), Betty Castor, Property Appraiser Bob Henrique, Linda Saul-Sena and Alex Sink. What else do we know about Capin? She is the Vice-Chair of the PTC. Who else is on Capin's host committee? Republican County Commissioner Victor Crist who is the Chair of the PTC. Also on the host committee are Lou Minardi and Nancy Costellano. Who are they? Minardi is the President of Yellow Cab. Nancy Costellano was a former executive with United Cab for many years and she now owns ABC Taxi. At the local Delegation meeting, a John Madiedo spoke opposing the proposed bill to abolish the PTC. According the PTC's November 13 minutes, Madiedo is an insurance agent for Professional Insurance Center who states that he insures 70% of the public transportation vehicles in Hillsborough County. In addition, his business is located at 2003 W. Kennedy Blvd. Tampa, FL 33606. Guess where the PTC is physically located? According to the PTC website they are located at 2007 W. Kennedy Blvd., Tampa, FL 33606. "The PTC rents its building from John Madiedo, who provides and does the insurance for the almost all of the taxicab companies the PTC regulates. When Kevin White had his security firm, he rented the office next door from the PTC and Madiedo. However, since White left the space, it is being rented by Michael Moses. Michael Moses is the owner of the taxicab company that caused some controversy by loaning White the money to buy his new Riverview home." We all remember Kevin White, the chairman of the PTC who was arrested and convicted on bribery and corruption charges related to his position on the PTC and he went to prison. According to this TBT article back in May 2011 which was before White was arrested in June 2011, White was upside down on property loans yet secured another loan for a house in Riverview. How did that happen? The TBT reported that White got a mortgage provided by Moses Investment Holdings. The only listed officer for the company is Michael J. Moses. Moses is part owner of two cab companies, a limousine operator and van service, all regulated by the Hillsborough County Public Transportation Commission, which decides who gets permits to operate cars for hire.The loan to White is the only mortgage Moses Investment Holdings has ever recorded in Hillsborough County. Agency records show Moses formed taxi, van and limo services, all under the name Bay and Beach, in 2009 with Nancy Castellano, a former longtime executive with United Cab. The next year he became an officer with ABC Taxi, which Castellano owned. Together they hold permits to operate 21 cabs, three vans and seven limousines. 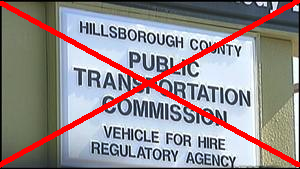 ...the Hillsborough Public Transportation Commission limits who can run a taxi cab business. Drivers must have a permit to operate, and in Hillsborough, nearly all the permits are held by United Cab, Yellow Cab or affiliates or subsidiaries of those companies. The Transportation Commission has awarded almost all of the 472 existing permits to the two cab giants. Drivers say the commission's regulations, which require 24-hour operation, make it hard for small businesses to break in. This was back in 2000 and the taxi cab cartel anti-competitive attitude and behavior is still in play today. Why hasn't the PTC eliminated the burdensome $50 minimum charge for limousine service? How does this taxi cab protectionism continue and why? Because the circle of money keeps flowing. Campaign donations flow from the taxi companies to the elected officials sitting on the PTC Board and the Board continues to protect the taxi companies by stifling competition and keeping burdensome regulations inhibiting free market competition. 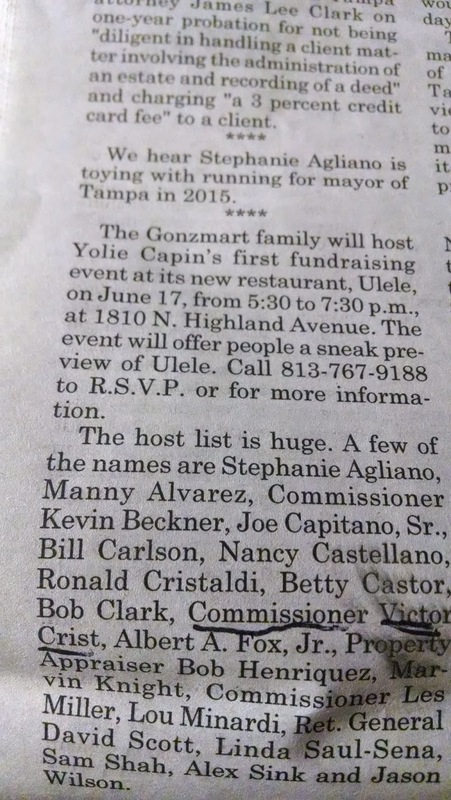 The coziness of these relationships are exposed by this fundraiser for Yolie Chapin, Vice-Chair of the PTC and her host committee that consists of the Chairman of the PTC Victor Crist, two other Democrat County Commissioners and the two largest cab companies in the county. Were there any violations of our Sunshine Laws at this fundraising event? Uber is now worth $18 BILLION today. The market says these are services we want and Uber and others such as Lyft, SideCar, etc. want to provide. That's how free markets work. We will note that United Cab, Yellow Cab or ABC Taxi are NOT Better Business Bureau accredited companies. This is why the taxi cartel is fighting so hard against Uber, Lyft and ride-sharing services: the taxi medallions which in today's technological age may seem archaic. Here's the transcript from the PTC meeting in May. The taxi cab companies brought up the issue of insurance with regards to the ridesharing services. Those issues can be resolved. No wonder Mr. Madiedo opposes getting rid of the PTC. He's got a monopoly providing insurance to the taxi cab companies the PTC regulates. After public comments were made PTC Chairman Commissioner Crist decided to launch into what sounded more like a campaign stump speech. He meandered through his political bio starting with "my first elected position was student treasurer in seventh grade" and he won the candy bar contest and ended with a plea for his credibility. Crist is running for re-election in November. Is the PTC the Regulator or Protector of the taxi cartel? Prosperity for all comes from encouraging innovation, not coddling greedy cartels. We've connected the dots. The PTC cronyism has been exposed. Actions speak louder than words. The PTC cannot reform itself. Time for the PTC circus, it's circle of money, protectionism and cronyism be eliminated! Did PSTA Waste $5 Million?